New section on UK Free TV dedicated to cutting the cord. 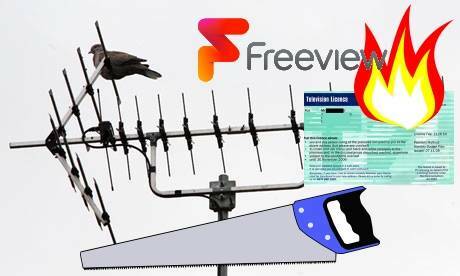 Freeview and Freesat were where you used to go if you wanted great TV, but could resist the temptation of subscriptions. But that was so The Naughties. Now you can save loads of money by not watching live TV at all by joining the million homes who have “cut the cord”. I can only speculate to the reasons why, but 4% of homes in the UK have done a very British version of what the Americans have dubbed "cutting the cord". Over the pond,many homes have been dropping their cable TV contracts and really a world of entertainment with broadband with, say, Netflix. Over here, people are not just ditching Sky or Virgin, they're saving themselves another very easy £150 every single year by selling their TV. By putting your home out of reach of live TV - that means Freeview, Sky, Freesat or cable TV - you are not required to pay a TV licence. One simple way to achieve this is to use a flat screen computer monitor. Another way is to sell your Sky and Freeview+ boxes, or give them away. As long as you can't turn on a TV and see a live TV show, you're £150 better off. It's easier than ever to do. A Chromecast will convert any screen with HDMI into a internet TV, for less than £30, too. And the thing is, the law says you can use the BBC iPlayer, ITV player, All 4 and Demand 5 for free. So you don't pay a bean but you can legally watch every BBC drama, documentary, comedy, soap and film. This is great news and it seems that 4% might be the start. Ah... Yes, it seems there is a £150 million hole in the BBC budget. So, this might mean radical savings being made right away. This isn't a theoretical £600m in three years from lost over 75 funding. It also is not the £200m lost from decriminalisation after 2017. This means cuts in the next month. The most likely suspects will be BBC Local Radio, as this only just survived the last lot of cuts. The whole network mightt be gone by Christmas, the frequencies carrying 5 Live until then. I also suspect BBC Three will go online in weeks, not months. It may also take Radio 1 will it to become BBC 16-34. Watch out for BBC FOUR showing only repeats, hinting at it closing. The same is probably true for Radio 3 too. Either the Licence fee is raised or the BBC will end up a core service. That's not your fault, is it? Until then, welcome to UK Free TV, the new home of cord cutting. Tomorrow we start with a check-list. Help with Outside the UK? So its quite right that it offers a load of public service programmes - thats its job! And its does it generally very weel, although not everything is all that great. Yes, its commercial funded, although in 2007 when financies were tight it was granted money from the licence fee, which never happened due to the government at the time apparently looking more generally at PSB. Of course the BBC now has to support S4C, rather than C4 doing it, so the burden has shifted to the licence fee. And the head of C4 (despite falling viewership) has got about 850 grand (including bonus), which almost double the amount the BBC's DG gets. Thanks for the replies - please accept my apologies for the delay in replying. Reading my post again, it came across a bit defensive. Sorry about that, I'm not usually a stroppy git! For what it's worth, I'm not an anti-BBC type, and Mike, you raised some good points regarding most peoples screens being mostly tied into a 'corded' environment. I guess I'm the exception that proves the rule. So, why am I here? My story is probably not very typical! Things got worse for me for a while, and basically I was bedridden for a few years, with nothing to do other than watch TV. I actually had a small breakdown relating to the intense boredom and frustration of nothing but Kyle and This Morning, and other mindless daytime pap. A few years ago, I got into hospital, and then spent a year in a rehabilitation unit. I'm now much better, and in my own flat, and naturally brought my TV with me, but found that after my experience, I've basically lost all interest in watching programmes! I keep up to date with tech/news/politics via the internet, and my video viewing is basically just YouTube and similar. I only actually got the DLP projector a few weeks ago. The other projector and TV are boxed up. I have it hooked up to an android MK908ii - basically an android TV stick. I have many DVDs I've bought over the last few years, but have watched literally zero of them. I guess a Blu-ray player and Blu-ray disks will be my next purchase. So, to answer your questions, I don't subscribe to Netflix, Amazon, or any other service. Since getting the projector, my usage has averaged 30 minutes a day of YouTube. The rest of my 'downtime' is either doing techie stuff, or going out. I no longer have the patience to sit down and watch TV. Phew. Yeah, a most unusual situation I guess - it was unfair of me to respond to your post the way I did, because I'm not exactly a typical 'screen' owner, and your points were basically valid! P.S. Brian, I read the other thread regarding your absence. I hope you recover soon! I know how hard it can be to distance yourself from your passion, but your recovery is more important! The regulars (and regular lurkers like me) will still be here when you're fit and well. Jamie Jones: There is nothing wrong with 'The Young Turks' - I've been a fan for years, when they were on the (now sadly defunct) Air America radio network. By the sound of it you'd really like Marc Maron and Rachel Maddow (AA alumni), and you really need to take a look at DailyKos.com, sounds right up your street. I've been a US politics geek for more than 30 years, and its so much more bizarre and interesting than our own, so I understand where your coming from. And check out KCRW and KEXP online - great podcast, etc. Your right when you say your unusual in your viewing habits - not even Netflix, Itunes or Amazon (unlike the bulk of cord cutters), just pure Youtube and the net. I suspect that buying a blu ray might help with the res on your projector, but if you can't stand more than 15min at a time of actual viewing, I'd ease myself in slowly..
You mentioned on another thread that 'I will admit though that I don't like the licensing company, and the bullying misleading tactics they use.' I'm not sure they are either, although certain websites do tend to use that sort of language. You have to remember that the vast majority of people in the UK do have a TV, and since all TV's are sold with a tuner, and you can use a bit of old wire as an aerial, you might not want to take people at their word when they claim 'they never watch TV'. I remember Brianist citing the number of 500,000 for the number of people who don't pay for a licence when they should. By the time the courts are involved, that's fallen to about 180,000 (the rest have paid up), and 155,000 of those cases are just paperwork with people pleading guilty. In other words, 95% of people who have been evading the licence fee have paid up. So the courts are basically left with 'special cases' and those who would set off an argument in an empty room. From your point of view, your projector is fine, as is your monitor - its just the TV with a tuner which they might reasonably question, and its not unnatural for them to be sceptical, because experience says they have every right to be! BTW - what audio setup are you using, because there is some really interesting kit out there, often at good prices. Arrival needs updating due to BBC changes.